I'd heard about the relatively new garden on the "Gardening with Cisco" show. Today was likely to be the last nice day for a while as rain is again predicted for at least the next week. 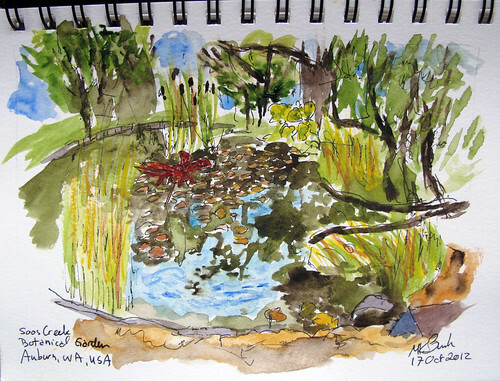 My first sketch was of the pond. In the middle is a dragonfly sculpture. There really were lots of them about the pond and couple actually perched for a a matter of seconds on my water container. They quite surprised me. 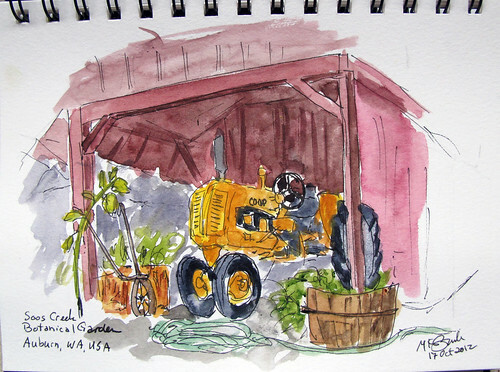 Next I went back to the Demonstration Vegetable garden to sketch that nice old tractor. This is my second tractor in less than a week. More details and some of the photos are on my personal blog.